Reptile Day takes place as part of the Dinosaur Discovery Days at Dinosaur Ridge in Morrison Colorado in July. This featured event will have special guests from the Denver Zoo, Wild Wings, Morrison Natural History Museum, Mr. Bones (giant Dino puppet), the Canyon Critters, and more! 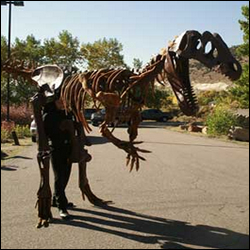 Hands on activities will be available for the kids, along with all the great activities at Dinosaur Ridge.